Dallas broke open a 3-3 game late in the second period, converting twice on a five-minute power play that resulted from a brutal hit by the Jets’ Anthony Peluso on Stars defenseman Alex Goligoski late in the frame that sent "Goose" to the locker room for some medical attention. "We said it before the game, special teams is going to make a difference. Our power play got a couple tonight and it made the difference," Benn said. "We didn’t really change anything. We just stuck with it and found a way to get a couple tonight." "I thought the Peluso hit was a joke. For a guy that plays that amount of time and runs a guy like Goligoski from behind, what does he (Peluso) play? Three or four minutes a game? And he’s got to run Goligoski from behind, go run one of our bigger guys," Ruff said. "These are the hits we want to get rid of. There’s really no place for it. It was a hard-hitting game but we don’t have any room for that type of hit." 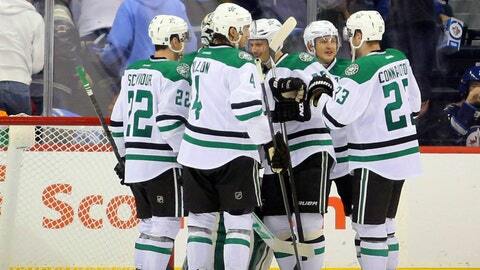 "It’s very important (to win games like this)," Benn said. "They’re kind of four-point games. We know standings are pretty tight in the Central here. When you can get two points on the road, it’s pretty big."